Shutter priority mode is useful in any situation when you want to control the shutter speed of your camera. 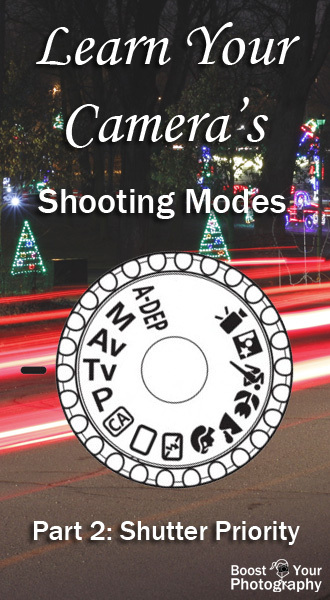 In shutter priority mode, you set the ISO and shutter values, and the camera will choose an aperture, based on its calculation of the correct exposure. (Read more about correct and creative exposure in the article All about Exposure or about ISO in ISO Basics.) For many cameras, shutter priority mode is labeled S for shutter, but Canon cameras use the abbreviation Tv for time value. Not sure what shutter speed to use when? Start with the article Shutter Speed: an overview for a quick introduction to various shutter speeds. Or read Shutter Speed Guidelines for a handy pocket-sized reference about recommended shutter speeds. When you want a moving subject to appear sharp, you need to use a fast shutter speed, otherwise some or all of your subject will turn out blurred. This is a common problem if you are interested in shooting wildlife, pets, or children. A general rule of thumb is to use a shutter speed at or quicker than 1/250th of a second, but very fast subjects (like birds in flight) may need a shutter speed on the order of 1/2000th of a second. If you are shooting without a tripod, practice, good posture, and steady breathing can help you keep your camera steady, but there is a limit. The general rule-of-thumb is that you can hand-hold for the fraction of a second equivalent to the focal length of your lens, so 1/50th of a second for a 50 mm lens or 1/200th of a second for a 200 mm lens. Image stabilization (IS, variously called vibration reduction or vibration control) can extend that speed slightly. Especially if you are shooting in low light situations, you may need to change to a higher ISO or a wider aperture to maintain the shutter speed that you want. Longer shutter speeds allow you to use light and light painting for fascinating photography. Longer shutter speeds can blur traffic lights into interesting patterns (read How to Photograph Traffic Light Trails) or nighttime carnival rides (read Long Exposure Photography at the Fair(e)). You can spin orbs of light (read Light Painting: how to spin an orb) or orbs of fire (read Spinning Fire with Steel Wool Photography). You can even shoot swirling patterns in the stars (read Stacking Photographs: Beyond Star Trails). Each of these various techniques involves a tripod and a shutter speed measured in full seconds and longer. This week your challenge is to try shooting in shutter priority mode. Seek out some situations that might require a specific shutter speed, whether it is a quick speed to capture a fast-moving subject or a long, slow shutter speed for artistic impact. See how controlling your shutter speed can help you get exactly the shot you want.